The Spanish Fundraising Association claims that 20% of Spanish residents give to charity, with almost 3.6 million regular donors, contributing €489 million in 2014 in Spain. Far from the Spanish Third Sectors’ hay day of €825 million donations in 2007, the reduction in charitable contributions can be blamed on tough socio-economic factors causing: individual de-registrations, Government cuts in subsidies, and difficulties in securing funding- all having massive implications for NGOs and their fund-raising forecasting. Individual and corporate donations have now become a big focus for charities in Spain. With average individual donations of €133 per year, and new efforts into Street Fundraising resulting in approximately one quarter of all new donors. NGOs persistence is paying off! So, how can you reduce your taxes by donating to charity? Recent fiscal changes regarding charitable donation have allowed a 50% tax credit for individual contributions up to €150 (up from 25% in 2014), increasing to 75% in 2016. These can vary, depending on the organisations themselves and which requirements they comply with. Anything above €150 will benefit from a tax credit of 27.5% rising to 30% in 2016. Additionally, loyalty pays off with ongoing donations to the same charities benefiting from a 32.5% tax credit rising to 35% in 2016. Donors should ask the charity for a certificate ‘certificado de donación’ to prove their charitable contributions and should fill out the Modelo 182. 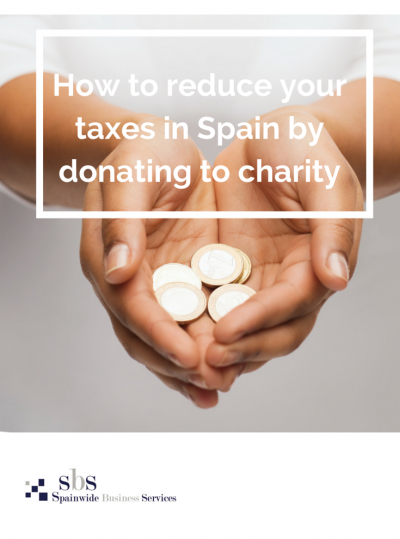 There is also a 0.7% tax option available to Spanish taxpayers able to elect a voluntary additional donation to the Catholic church or a non-profit active in social action or cooperation. For corporations, there is an improved 35% tax credit on the Taxable Base of donations for qualifying organisations, capped at 0.1% of the company’s turnover. Additionally, long term collaborations with the same NGOs are encouraged to reach fiscal advantages and benefit from a higher tax credit of 37.5% rising to 40% in 2016. Please contact us at Spainwide to help you prepare your Declaracion de la Renta 2014 or to manage your tax and accounting obligations!